Back in the excess-is-best 1980s, the pared-down minimalism of 1984's Stranger than Paradise played like the product of another time--or even another planet. It was so "off," i.e. offbeat and off-kilter, it was (right) on. Now seen as a classic of American independent cinema, it compares favorably to other monochromatic first features, like Border Radio and Mala Noche (also lovingly restored by the movie mavens at the Criterion Collection). The acclaim was justified--except it wasn't Jarmusch's first film. That honor belongs to 1980's Permanent Vacation, making its long-awaited digital debut on this two-disc set. Shot by Tom DiCillo, Jarmusch's initial offering revolves around the name Parker: Chris Parker is Aloysious Parker, a ducktailed New Yorker with a jones for Charlie Parker. Allie's a drifter and a dime-store philosopher. "That's how thing work for me," he drawls in voice-over, "I go from this place, this person, to that place or person." And so he does. Fresh from NYU, where he assisted Nicholas Ray, Jarmusch displays an innate talent for framing and dialogue (Allie lives for "vibrating, bugged-out sound"). His touch with actors--Frankie Faison's raconteur aside--is less assured, but he learned quickly. Lounge Lizard John Lurie cameos as a sax player. DiCillo returns for Stranger than Paradise, in which he and Jarmusch trade color for black and white stock (donated by Wim Wenders). In this "semi-neorealist black comedy," as the filmmaker puts it in the production notes (included with this set), Hungarian teenager Eva (Eszter Balint) arrives in New York ("The New World") to stay with her cousin, Willie (Lurie). A drifter, like Allie, she continues on to Cleveland ("One Year Later") and Florida ("Paradise"). With nothing better to do, Willie and Eddie (Richard Edson) tag along. As opposed to the rapid-fire cutting of the day, Jarmusch uses static shots divided by black screen. He may have taken cues from Ozu and The Honeymooners--dig those porkpie hats--but the end product couldn¡¯t be more idiosyncratic. It's an old Python joke but it best sums up my feeling towards all the glowing reviews of what appears to be a technically competent but boring movie. Seriously, though. I did write a very fair and objective review of this film a few months back but it never got posted. So instead of retrying to capture the essence of that first review, I'll just give you my side. Obviously, I hated it. I watched it several times to try to see what in heck its admirers saw in it and I'm still at a loss. And I happen to love independent cinema. I also attended class at NYU with the actress and would loved to have showed others but I can not see anyone beyond the already converted who would be able to stay with the movie more than 5 minutes. I honestly feel there is an Emporer's New Clothes mentality at work where a good portion of the people are afraid to admit that the "don't get it". As a film geek with an extensive video collection of independent films, I can say with confidence and reassurance to those supposedly clueless people that THERE IS NOTHING TO GET. Nothing acting (and Ms. Balint can act a helluva lot better than what is shown here), nothing dialogue, nothing plot. gimmicky blackouts and master shots do not add up to something. At least not in this fellow's eyes. And now for the PC tag: Film, as with anything in the arts, is subjective. There is no good or bad. If you like it, great. Then to you it's good. So I do not discourage anyone from seeing this film. I'll just give my opinion and one star rating (and believe me, if I had the option, I would have been pressed to give this over rated movie a 1/2 star). Dull doesn't begin to describe this movie. I got the feeling that the camera man was on quaaludes, and the actors wished they were. We did get a few laughs out of the movie, but I assure you, the director didn't mean them. 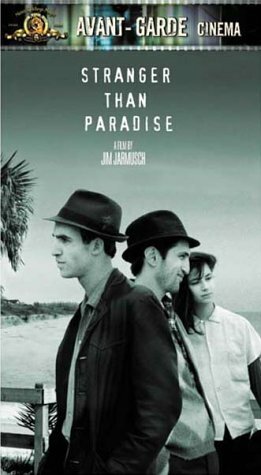 The many virtues of Jarmusch's second feature, the 1984 "Stranger Than Paradise," have largely been pointed out here already. Thus the novel structure of single take scenes divided by black frames, the low key, seemingly natural acting, and the wonderful photography which creates a requisite ugly "sameness," whether the locale is the Lower East Side, wintry Cleveland or the Florida boondocks, need not be discussed again at length here. One aspect of this memorable film which should be more clearly emphasized, however, is its remarkable tone, one which the relatively young director establishes and never loses control of. It is a tone which combines satire free of sourness with an unforced charm never tumbling into sentimentality. Though the central male characters, Willy and Eddie, are petty card cheats and race track gamblers who are on the road and drifting through existence without much purpose, they are often undeniably charming, even believably sweet. Noteworthy in this regard is Eddie's endearing wish to include visiting cousin Eva from Budapest in the gambling pair's daily activities and gruff Willy's even buying her a dress, although an ugly one, to wear to Cleveland. Similarly, this heroine Eva not only establishes her right to membership on their team through her theft of groceries and cigarettes for the initially unfriendly Willy, but reveals at the same time her own sweetness in consistently sharing any ill gotten gains with both of these hapless guys. I saw this movie in 1984 in a great old theatre in Sacramento, California...three times. This is without a doubt my favorite movie of all time. I've read all the reviews and believe me, I get it. This movie arouses either passion or boredom, there is no in between. I love it though. I laugh hard everytime Eddie explains 'choking the alligator'. The extended scenes without dialogue are wonderful. I fell in love with Eva for awhile I'm sure. i don't care what anyone says, i love this movie. sure, the plot is simplistic. Hello? Is any body out there? I'm laughing at some of these reviews. Nothing happens? There really is no message? Boring? No character depth? People, it's not hard to get an education in this country. Maybe some you should look into enrolling somewhere. There are immensly tantilzing themes in this movie which are dramatized so beautifully it's almost painful. Not one person touched on the startling power of a young man who falls in love with his own cousin. Talk about immposible love. Or the slow, almost invisible build of their friendship told exclusively through subtext revealed through a bare minimum of words. No theme? The scene of three young people looking out into the white fog over a winter lake not obvious enough? This image perfectly captures the frustration of looking for an illusive, promised paradise in the land of milk and honey.